Whenever we hear about the Scream movie franchise it is eternally remembered as one of the most iconic horror thrillers of all times, confirmed by the fact that it went on to release another three sequels grossing a combined collection of USD $600 million. 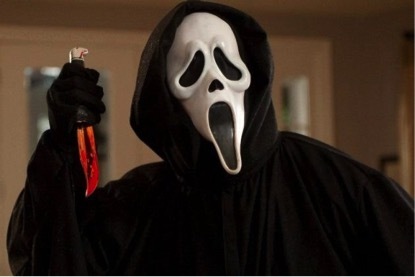 It is difficult to find anyone who hasn’t seen at least one of the films in the series – almost every household’s guilty pleasure due to its popularity with TV cable operators all over the world, plus the hard-to-forget legendary killer “Ghostface”, black-cloaked with that white sunken mask and bloody kitchen knife. Ghostface is voiced by Roger L. Jackson, a renowned Hollywood voice over artist named Hollywood’s forty-sixth best-kept secret by E! Entertainment for his work in the Scream series. Director Wes Craven surreptitiously made Jackson hide on set, keeping him a secret from all actors and crewmembers in order to actually make the actors believe they had actually received a call from the notorious Ghostface. This enabled him to capture a genuine look of scare on the actors’ faces when they picked up the phone and heard his voice. The key reason for the series’ critical acclaim was that the concept of the film became iconic for rejuvenating the horror genre in the 90’s. Prior to its release, horror was saturated with regurgitated plots from earlier decades causing for an uninteresting and stale time for the industry. Scream therefore, was a crisp and fresh change revitalising the genre with its clever combination of out-dated slasher with nouveau American college humour, along with attention to typical horror film cliché subsequently crafting a smart plot that was fresh and original.